I am sure that you know that there are many different scientists on board, all researching pieces of the Bering Sea ecosystem puzzle. Recently, some of the scientists started talking with each other because some of the results have not been what they expected. They asked, why is this happening and what is causing this to happen? There were some puzzling results that couldn’t be explained from the samples. No dirty snow here. This ice is covered with ice algae. 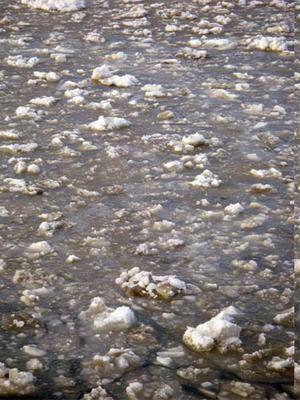 Ice algae is the producer of the Bering Sea. What the heck, you might say. How come this piece of the puzzle has gone unchecked? Might I remind you that many of these scientists are doing baseline studies? They are collecting data from one or more of the factors in the ecosystem. Never been done, at this time, in this place before. 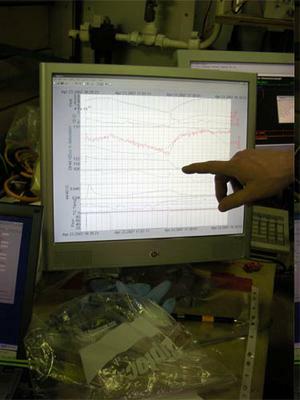 The information that is being collected is fed into a computer and displayed as a graph. So a meeting was called. At that meeting were the researchers who were discovering that there was something missing. These researchers told the group of scientists that they believed their missing data had to do with the ice algae. 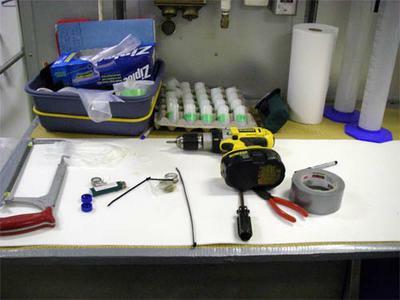 That they needed access to algae samples that were not sent into shock from the collision of the icebreaker and the ice. 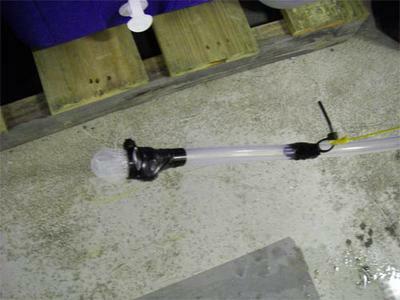 Scientists often have to make their own data sampling equipment. It is a mixture of science, engineering, and creativity. Now here is the interesting part. Everyone agreed. EVERYONE agreed. 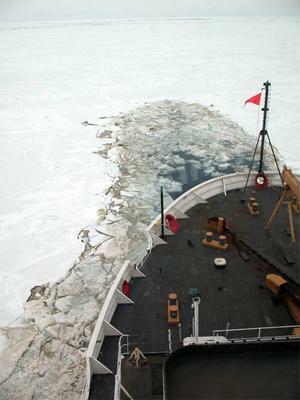 This aspect of the BEST (Bering Sea Ecosystem Study) cruise had not been included in the research plans. 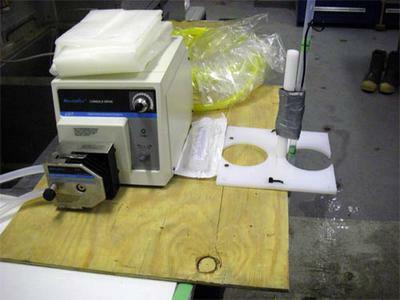 Time to develop another protocol and possibly another piece of equipment that would permit the researchers to gather untouched pieces of the algae. 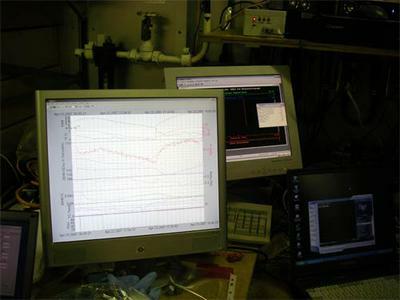 Researchers need to get samples of the water and sea algae. In order to get it, they need to pump the stuff up out of a teeny tiny hole they will punch through the ice. So it became a true collaboration. Everyone worked together to create the protocol, make the sampler, to decide time of day to collect and for how long and for how many. The nutrient scientists worked with the zooplankton folks worked with the mud researchers worked with fish acoustics. Now there is a plan, and a protocol, and scientists who will be sampling ice algae from undisturbed areas in the ice. The plan was created in just two short days, in addition to their crazy research schedule. This group of scientists is pumped to find out the role of ice algae in the ecosystem of the Bering Sea. This is a new ice filter that was created especially for this machine. Stay tuned to this website as I am sure there will be more interesting data that will come out of all this. 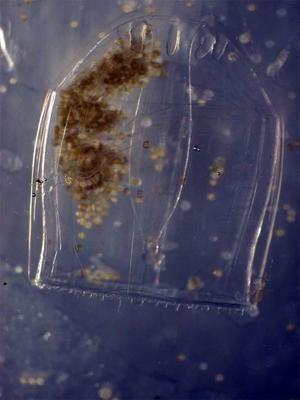 These small creatures are one of the many producers in the Bering Sea ecosystem. I realized that I was doing you all a great disservice by not featuring the most important creatures of all, the producers. Producers are organisms that take the radiant energy from the sun and transform it into food (chemical) energy. These little bitties form the first link in a food web or chain. They are the link between the physical and the biological. They are the photosynthesizers. 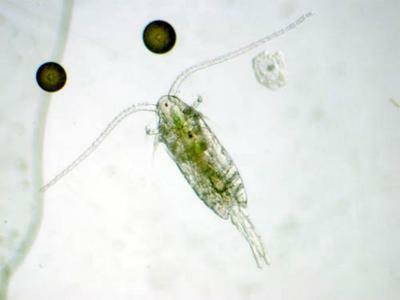 It’s easy to feature the cute seal pup, or majestic bald eagle, but phytoplankton? Sea algae? Where’s the glamour in that? Come closer and have a look at the backbone of the ecosystem, come meet the microscopic creatures of the most productive marine ecosystem on Earth, the Bering Sea! It actually starts with the rich nutrients that are circulated in complex cycles through the icy sea. The first indicator that something is going on is the ICE. This isn’t dirt on this monster ice cube. It’s ice algae, one of the main producers in the Bering Sea. There are many different kinds of Diatoms that live here, use the rich nutrients dissolved in the sea and transform the energy of the sun into food. This ice isn’t dirty. It’s colonized by ice algae, one of the backbones for the Bering Sea Ecosystem. Enter the copepods, krill, bigger zooplankton that chow down on these little ‘plants of the sea’ and in doing so transfer energy from the phytoplankton into them. Next it’s a free for all with something eating something else, a living luau that bubbles and brews and transforms and transfers. From creature to creature to creature and then one more. Nothing is wasted, everything is a part of and needed. And suddenly, it’s over, but not really, it’s just reformed and recycled. The body decomposes, enters the nutrient cycles, and becomes part of the growing phytoplankton bloom ready to explode as soon as the ice melts.